Huran: 23 year old man from Katapesh. Huran is thin and muscular and stands about 5'8". He has brown eyes and dark brown hair, and can often be seen with short facial hair (he forgets to shave). 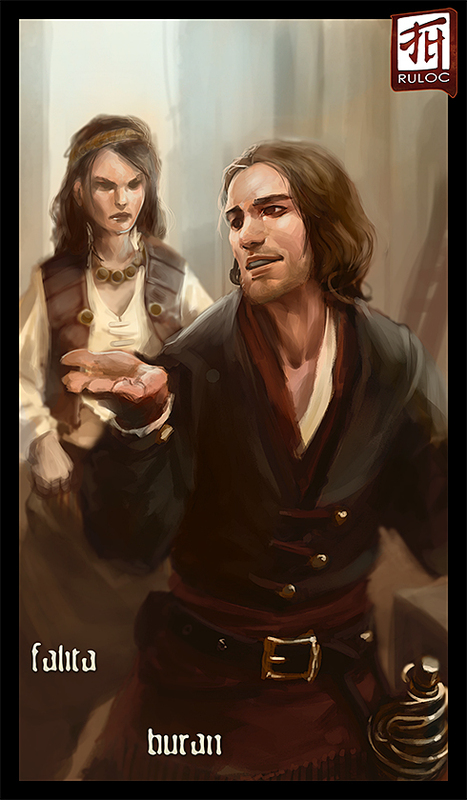 He grew up on the streets of Katapesh and survived by his skills of stealing and rapier fighting. He often teases Falita whom he has known since birth and likes to claim to be the best swordsman in the known lands (often challenged by Falita). His character class is Rogue/Duelist. Falita: She is a 25 year old woman from Katapesh. Falita is thin and lithe and stands at 5'5". She has the build of a dancer, which is also her profession (she is a Dervish Dancer/ShadowDancer). She has black hair that goes to her mid-back and dark brown eyes. Her clothing allows for freedom of movement, but also fits in with the Katapesh style. She wields a scimitar more often than she casts bard spells. As for personality, Falita is a spitfire. She also has a love of bantering, and enjoys teasing Harun unmercifully (whom she has grown up with). She is not afraid to put a stop to seeing someone being picked on by others, but she also doesn't go out of her way to cause trouble.